A couple of days ago, I wrote a post flagging up the considered view of Professor John Gray on the potential motivation of voters in the USA and the election of Donald Trump. The underlying point of his “letter” is that economic factors rather than social factors account for the result. This opinion is not shared by all, and for good reason. The ever-vigilent Mehdi Hasan – has looked at the available data on the demographic that voted for Trump. It may not be as clear cut as we had thought. In actual fact, he argues, those who have been left behind economically – despite the logic – were not those who voted Trump. Rather it was those who have done better than average under neo-liberalism who put him in the White House. And the disturbing conclusion is not that the election was decided on economic issues. It was pure racism. Luckies hoping we do not notice? 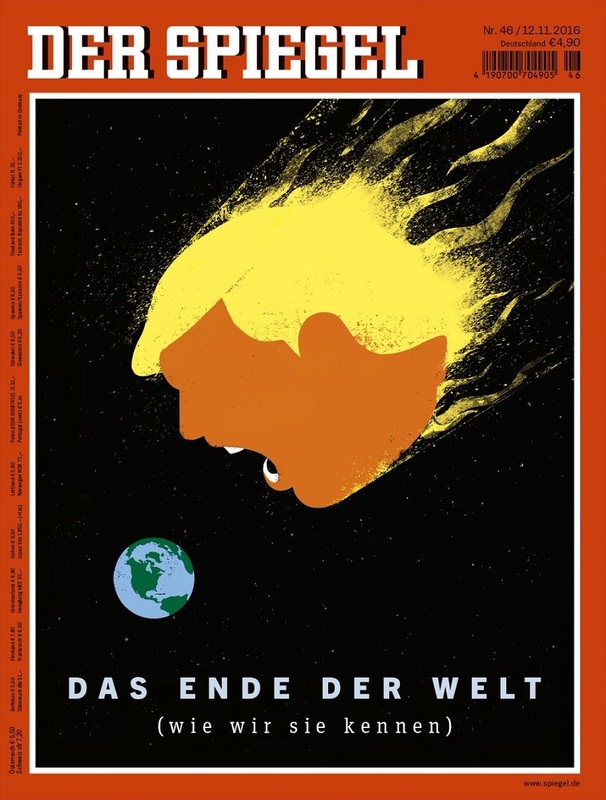 I suppose that when the UK leaves the EU and Nigel Farage becomes PM at the behest of the US President, then cigarette advertising will be back on the streets of the UK as they are in Germany. 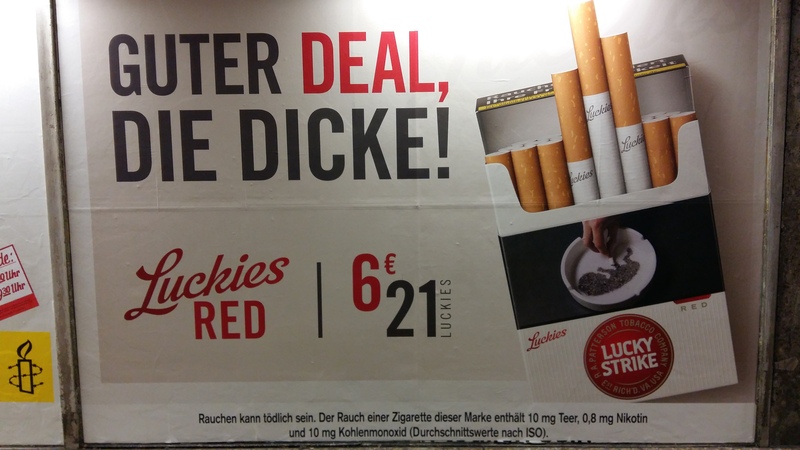 The run up to Christmas is not the best time to see this particular species of advertising, but the Lucky Strike – Luckies – brand is loitering in U-Bahn Stations in Munich (left). What is interesting about this one, notwithstanding its lack of imagination – good deal and thick, if my translation is up to it – is that it is forced to show something nasty on the front. Inside the black band on the packet is an ashtray with the ash forming the shape of a foetus. This is the first time that I have seen this on street posters. It raises the question as to whether the advertisers could have avoided this by not showing the packet? If they are able to do so, then this is an even more stupid billboard than I had first thought. If they cannot, how is the negative image going to be represeted on more alluring advertising such as that practised by Marlboro, Camel and Gauloises? I trust the answer will come like the answer to plenty of other potentially lethal questions (Trump, le Pen, Wilders) in the much-anticipated 2017! After the Brexit vote I was grateful to a number of thinkers who had contributed to a week of short talks on BBC radio. I wrote about them here. The BBC revisited this format last week to help us to make sense of the US election. It was – as with Brexit – left to Professor John Gray to present a hard truth. I’ve taken the liberty of uploading it below. The stark reality, for Gray, and I fear for the rest of us, is that (liberal) progressivism is not the norm in European human history. Autocracy and war are more representative of earlier times over the continent. Moreover, humanity may get into an autocratic and illiberal mindset – indeed, vote for it – because progressivism is itself partial. Essentially, not everyone benefits and progresses. And this comes back to bite society. The question for us is whether what we are experiencing in 2016 – and probably further into 2017 with elections in the Netherlands, France and Germany – a reversible phenomenon. John Gray, I sense, is not so sure. 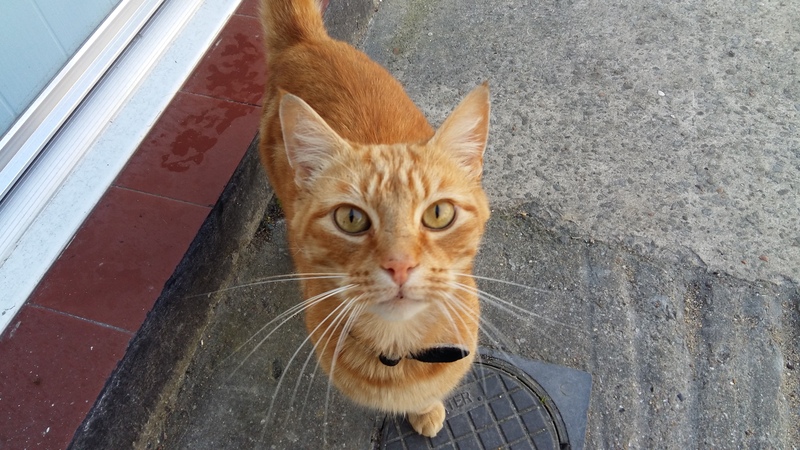 Regular readers of this blog will already know my political philosophy. The election of Donald Trump as president of the United States of America is truly regressive. It represents not only an existential threat to liberals, people on the left and humanity more generally, but also a mortal threat to minorities, people of colour, LGBT, amongst others. 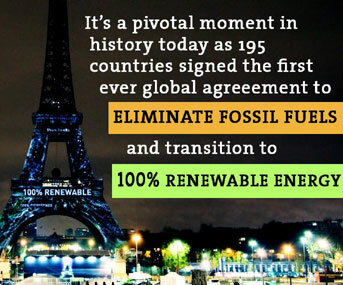 In my lifetime, this is unprecedented. I grew up anticipating nuclear war – this was a time of Threads – in a bi-polar world of two ideologically-fuelled superpowers. But equally I grew up in a post-fascist world. This missing link, however, is about to be filled. Fascism has arrived. The appeasement has started. With the noble exceptions in Europe of German Chancellor, Angela Merkel and French President Francois Hollande, world leaders waited for a call from Trump for an all-important opportunity to cosy up to him. 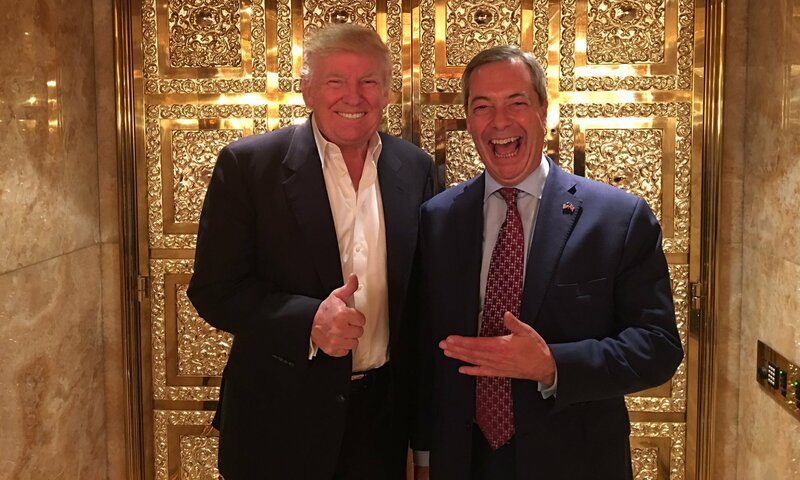 The British Prime Minister, Theresa May, had to wait quite a while on Thursday – she was 10th on his list – to receive a call only to find that Nigel Farage, UKIP leader, got a very early selfie-opportunity (below left) to discuss “freedom and winning” with Trump in his eponymous tower. …Trump, in his election campaign, also asked – and I paraphrase – what the point of nuclear weapons is if they cannot be used. And similar to his belief in allowing guns into schools counter-intuitively to prevent mass shootings, he believes in nuclear proliferation for the same reason. At the very least we might finally confirm that Israel is a nuclear power and maybe it is time to expedite North Korea’s nuclear aspirations? 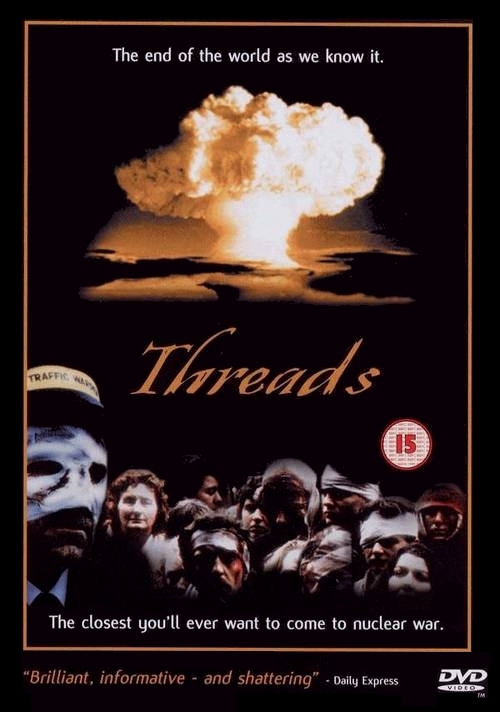 Back to a Threads scenario, I think. This fascism has consciously crept into the UK. 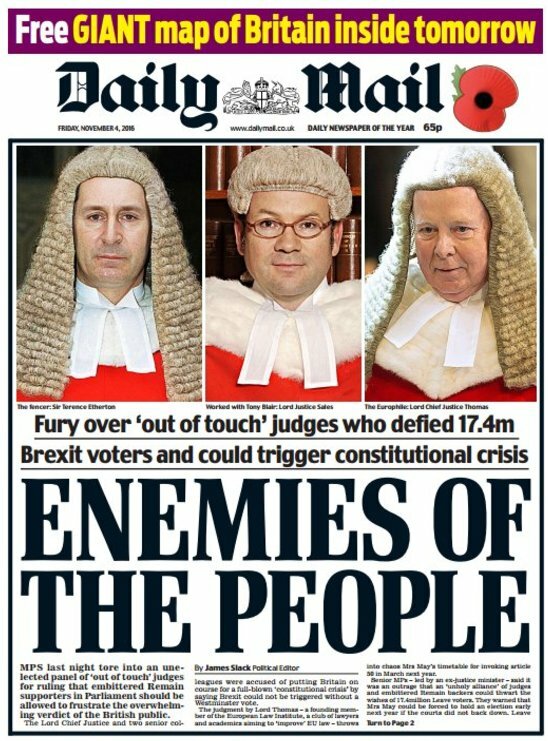 There is no better example than the Daily Mail’s front page after three lawlords interpreted British law – as they had been asked to do by a British citizen – and noted that, constitutionally, the Prime Minister does not have the power to invoke Article 50 (the leave the EU mechanism) without the approval of the sovereign parliament. This decision is being appealed by the Government and will be heard next month. But Brexiters – led by UKIP leadership candidate, Suzanne Evans given a platform on Today (Radio 4’s flagship news and current affairs programme) – that Judges are trying to impede “the will of the people”; namely leaving the EU. Nothing of the sort. But Evans believes, seemingly, that independent judges should be subject to control by the parliament (the very same one that the Government does not want to inform about Brexit conditions). This headline has fortunately had quite an impact. 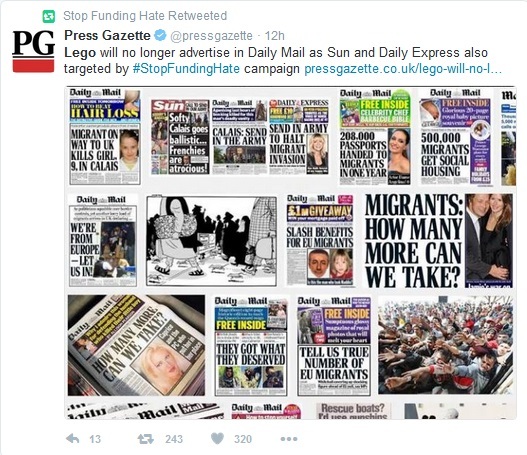 Stop Funding Hate is pushing to get advertisers to abandon newspapers that propagate hate as a matter of course. These titles include also The Sun, The Daily Express and The Daily Telegraph. Last week Lego stopped advertising with The Daily Mail (see below). The current effort is to put pressure on the John Lewis Partnership, a supposedly ethical employee-owned high-street retailer, to do the same. Its Christmas high budget mini film advertisements have become an anticipated festive season event in recent years. And they work. But some of the profit made goes into the pockets of these newspaper owners whose racist bile has undermined the fabric of British society’s values of tolerance, compassion and inclusiveness. 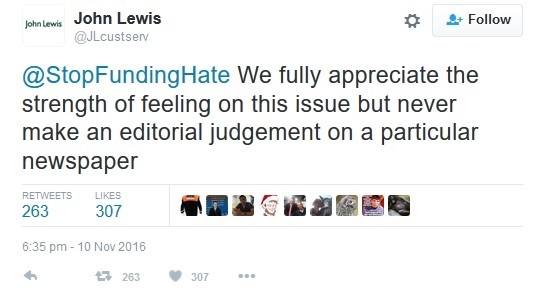 John Lewis has so far responded with an anodyne statement (left) indicating that the company does not judge newspapers by their content. Fascist support ing, then? Customers need to know that. And we must stop normalising this thinking. They will come for us, too. Finally, it is very difficult to enjoy comedy these days. Everything is beyond parody. Consistent throughout this US election campaign has been John Oliver. He tried hard to expose Trump’s fascism. His final show of 2016 screened on HBO on Sunday evening. Unfortunately it is not available in the UK to view. Some people have the means to Americanise their IP address. If you are one of these, I recommend. By the time the next series starts in 2017 he may have been deported (and HBO closed down).